Connect via your news items and press releases. Create a buzz that promotes your business. 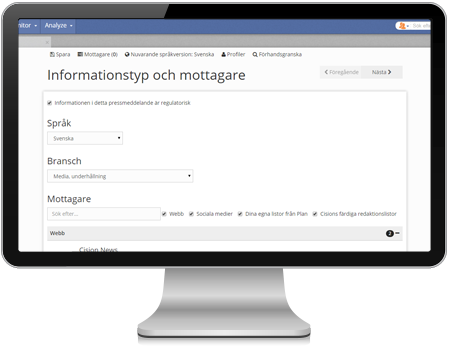 Using our distribution tool for news and press releases, you can easily manage your distribution and choose to whom and via which channels you want to spread your information – for example, news agencies, stock exchanges and your own website. You can publish your news items via email and SMS – and always in the manner that your recipient prefers to be contacted. Of course you can also publish your news items directly on your website and across all the major social media. 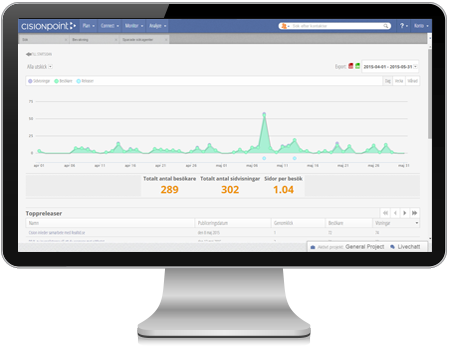 Irrespective of whether you want to distribute your news via email, web, social channels or networks, you can reach all your target audience simultaneously with our user-friendly tool. Now there are more ways than ever to connect via your news or press release. You can use our solutions across a wide variety of distribution channels to connect locally, nationally or globally to the target recipient. We ensure that your press releases and news items go out on time and verify it is the correct recipient before it is sent. We are here to help you select the best channels for each unique story and make sure it gets through the pervasive media cacophony all around. Irrespective of whether the news you are publishing is a publicly listed company report or has a commercial intention, we have a solution for you. We offer a range of channels for a variety of needs, and you choose to whom, when and how you want to communicate. 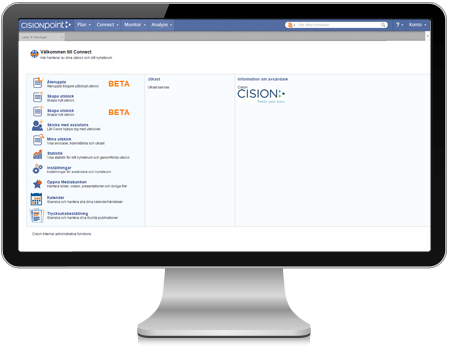 Through CisionPoint, you can publish and distribute your news and press releases to both traditional and social media, news agencies, stock exchanges, your own website and to our network. Your own digital newsroom at Cision News. At our news site, Cision News you get access to your own digital newsroom where you can gather together all your news items, press releases, photos and movies. Your visitors can subscribe to your newsfeed and easily share and spread your news on social media. You can also design your newsroom using colours, fonts and text size that match your website or your graphic profile. If you frequently work with the same type of recipient, you can create distribution profiles that make the task easier. By creating a new mailshot based on a marketing profile, all your choices for the mailshot are already preset, which means that you can get your press releases and news items out quickly and easily. Using our analysis tool, you can monitor statistics for views across our network and the opening of mailshots, to see who received your news and when. You get an overview of opened images and files in your mailshots, discover which of your news items are most popular in your newsroom, reveal what the visitor statistics look like and you can also see how your visitors got there.